U.S. Announces Sanctions On 271 Syrians Over April 4 Chemical Attack : The Two-Way The blacklisted people work on weapons development for Syria, the administration says. Treasury Secretary Steven Mnuchin says the sanctions "target the scientific support center" for the attack. 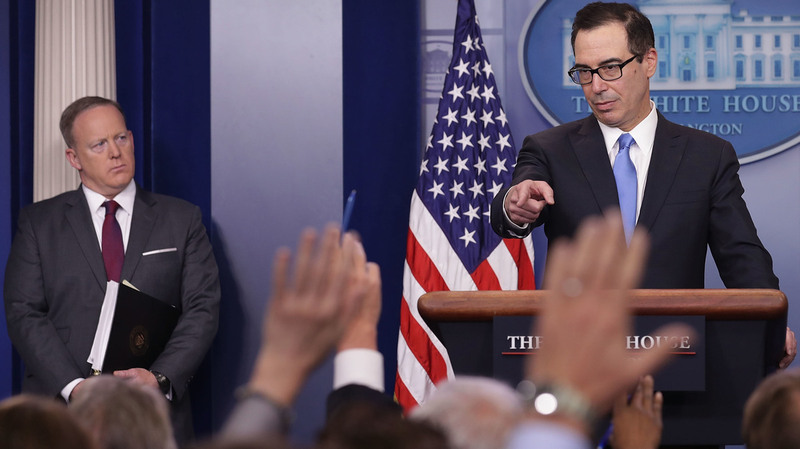 Treasury Secretary Steven Mnuchin talks to reporters during Monday's press briefing at the White House. Mnuchin announced sanctions against 271 employees of Syria's Scientific Studies and Research Center. The U.S. Treasury Department has announced sanctions on 271 individuals it says are scientists working on weapons development for Syrian President Bashar Assad. The new sanctions are a response to the deadly April 4 chemical attack in Khan Shaykhun, an attack the U.S. government accuses Assad of carrying out against civilians. "Employees of Syria's Scientific Studies and Research Center have been put on a U.S. blacklist," NPR's Michele Kelemen reports, "which means any assets they might have in the U.S. will be frozen and Americans are barred from doing any business with them." In a statement, the Treasury Department called the spate of sanctions one of the largest the Office of Foreign Assets Control has ever imposed. The department says in a statement that the SSRC is "responsible for developing and producing non-conventional weapons and the means to deliver them." "These 271 SSRC employees have expertise in chemistry and related disciplines and/or have worked in support of SSRC's chemical weapons program since at least 2012," the Treasury Department alleges. Earlier this year the OFAC sanctioned eight regime officials, as well as several organizations, over chlorine gas attacks in 2014 and 2015. "President George W. Bush first placed sanctions against the SSRC in 2005, accusing it of producing weapons of mass destruction. "Although the Syrian government promotes the SSRC as a civilian research center, 'its activities focus substantively on the development of biological and chemical weapons,' U.S. officials said." Assad has denied responsibility for the attack on Khan Shaykhun and even suggested that the attack — documented on video and described by international aid groups who treated victims — was entirely a "fabrication."